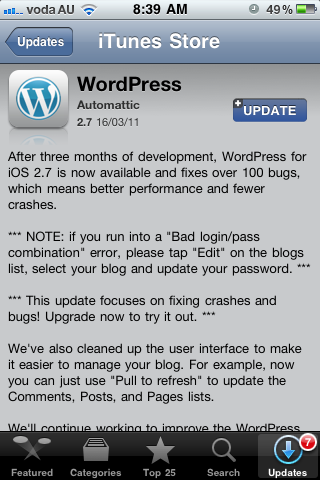 WordPress has update their iOS application to version 2.7. The latest release coming with over 100 bug fixes, which i must say did get very annoying at times with repeated crashes and functionality inconsistencies. The beauty of this WordPress app is it lets you manage multiple blogs right from your iPhone / iPad / iPod touch with a very user-friendly interface. I have had some problems with the app though, posts going missing after i edited them? So hopefully this new version kinks out the most annoying bugs. If you run a site on WordPress i recommend you make full use of this handy app!